My regular reader will know that I love the history of Spurs as much as I am propelled by the present. The international break gives me a long-awaited chance to invite you to join a campaign for recognition of one of Tottenham�s founding fathers, without whom I guess there would be no Tottenham Hotspur. We need to start at the beginning, when Tottenham Hotspur was first founded back in the reign of Queen Victoria and at a time when football was just developing as the national sport. Come back with me to the late nineteenth century and a legendary 1882 meeting that took place under the yellow glare of a gas-lit lamppost in Tottenham High Road, a corner-kick�s distance from what would one day become the White Hart Lane ground. It was a late summer�s evening and the gathering consisted of members of the Hotspur Cricket Club and pupils from the local St John�s Presbyterian and Tottenham Grammar Schools. These well-educated youths wanted something to do in the winter months, and there under the lamplight they decided unanimously to start a football team to be called Hotspur Football Club. The name �Hotspur� was inspired by Shakespeare�s Henry IV character Harry Hotspur (Sir Henry Percy), who was the son of the Duke of Northumberland and a brave and spirited warrior. There were local connections because the Duke owned large swathes of North London. Their first match on September 30 1882 was a defeat by two goals on Tottenham Marshes against a team called the Radicals, this at a time when football, particularly in the south, was almost exclusively amateur and six years ahead of the launch of the Football League. The London-based Football Association was the governing body and jumped on anything that hinted of commercialism or anybody earning from playing the game. What they would make of today�s �100,000-a-week footballers defies imagination. Most of the boys who played against the Radicals were still at school, and club accounts showed that they bought the leather-pannelled ball with which they played on the day of the match for one shilling. As a matter of record, the eleven founder members of the Hotspur Football Club following the meeting under the lamp-post were Edward Beaven, Robert Buckle, Frederick Dexter, Stuart Leaman, Edward Wall, John and Thomas Anderson, Lindsay and Hamilton Casey, John and Philip Thompson. They were the original Hotspurs. To encourage them, the father of the Casey brothers presented the team with a set of home-made wooden goalposts painted in blue and white, which the boys carried to and from the Marshes (it would be another eight years before nets were introduced to the game). In those early days he ran the club from his parents� home � White Cottage, No 7 White Hart Lane. 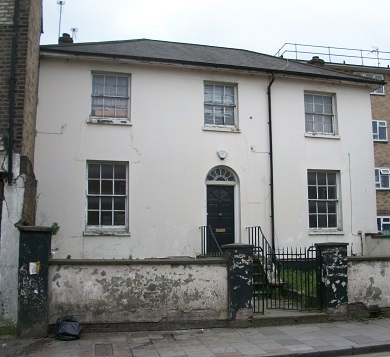 Despite the massive redevelopment in the area, the house still stands proud and defiant � if quite tired � and the heritage section at Haringey Council have agreed a grant for renovation of the property. Bobby�s grandson Michael Mackman � a true Tottenham Lilywhite in family tradition (Ed:- and Spurs Odyssey message board member! )� has provided the photograph of the White Cottage as it is today. Retired businessman Barry Middleton, one of a 250-strong Old Boys� Association from the now demolished Tottenham Grammar School, is an official club guide at the Lane and a walking record book on Spurs history. 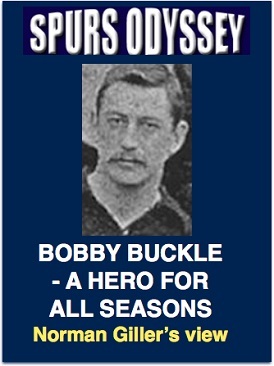 Yes, Bobby Buckle, late of the White Cottage, 7 White Hart Lane, is truly the original �one of our own�. Returning to the present, I sat in the Royal Box at Wembley yesterday and watched England struggle to beat Lithuania in their World Cup qualifier. The Spurs trio and old boy Jermain Defoe played reasonably well against a team interested only in defending. Lithuania not only parked the bus but took the wheels off. It would be easy to knock the England performance but this is a work in progress. Patience. Patience. I was a guest of the Football Association along with the other surviving sportswriters who reported the 1966 World Cup triumph in the Wembley of Twin Towers and 39 steps to the Royal Box days. We are a dwindling band of brothers but all warmed with memories of when the game was played with passion and pride by an England team that was feared and respected for its superbly organised and positive football. The team that laboured against passive opponents yesterday needs a leader on the pitch of Bobby Moore/Bobby Charlton stature. I have faith in Gareth Southgate's coaching skills, and given time his side could develop into a world power just like in the golden days of the '60s (the day before yesterday). Our Harry Kane just might grow into the sort of leader who can galvanise the team. I know that Gareth is immensely impressed by not only his ability but his enthusiasm and energy that rubs off on those around him. We lucky Spurs supporters know exactly what Gareth sees in him. The weather forecast is that we are approaching the hottest Easter on record. There is certainly a hot time ahead for all those with Spurs in the soul. I will soon increase my donation to the Tottenham Tribute Trust to �1,850 to help our old heroes who have hit difficult times, following my pledge that all profits from my Spurs �67 book will go to the Trust. That will just about pay for a new kneecap or hip, and maybe a little towards the caring costs for ex-players paying the price for the entertainment they gave us in the summertime of their lives. Sales have slowed to a trickle, but I am sure Spurs Odyssey readers are going to get behind this great cause. http://www.normangillerbooks.com/spurs-67/4554925859. It is the perfect present for Dads and (definitely) Granddads, who remember the days when Spurs were FA Cup kings. I am building a Wall of Thanks on line, naming every one who buys a copy of the book from me and so makes a donation to the Trust. I hope your name will be there. Please reach into your Spurs soul (and pocket) and help our old heroes. Not a penny is going into the author/publisher�s pocket. All for Spurs. Thank you. Email your answers, please, to SOQL32@normangillerbooks.com. Give your name, the district where you live and how long you�ve supported Spurs. I will respond, and will email a screen version of one of my Tottenham-themed books to the sender of the first all-correct answer drawn at random. Deadline is midnight on Friday. Please keep a check on your points tally, because the contestant topping the SOQL table at the end of the season will receive a framed certificate announcing the winner as the 2016-17 Spurs Odyssey Quiz League champion. And the first three in the final table will win an autographed, hardback copy of my Bill Nicholson Revisited tribute book, PLUS a souvenir card signed by Spurs legends Jimmy Greaves and Steve Perryman. A maximum three points in the SOQL table to those who answered Philip Beal, who was first-choice right-back in 1967 until a broken wrist opened the door for 20-year-old Joe Kinnear to take over the No 2 shirt. Phil later developed into one of the most accomplished central defenders in the League, playing a covering role alongside the mighty Mike England. Kinnear settled down to form a solid and at time spectacular full-back partnership with �Nice One� Cyril Knowles. 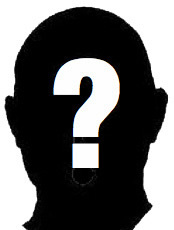 First name drawn at random from the correct answers is Keith Dibble, from Aldershot, who has been a Spurs supporter since 1965. I will be emailing Keith a screen version of one of my Tottenham-themed books. As regular contestants will know, the SOQL League table is decided on facts up until the final weeks of the season. Then I introduce tie breaks based on opinions, which is when I lose friends and fail to influence people with my views. But please remember, it is just for fun and helps us all refresh our knowledge on the history and the heroes of our great club.